’Tis almost the season for bazaars! Here’s how you survive. They’re called bazaaristas: entrepreneurs who flock to bazaars to ply their wares, hoping to be the next big success story—another Mary Grace or Aranaz. 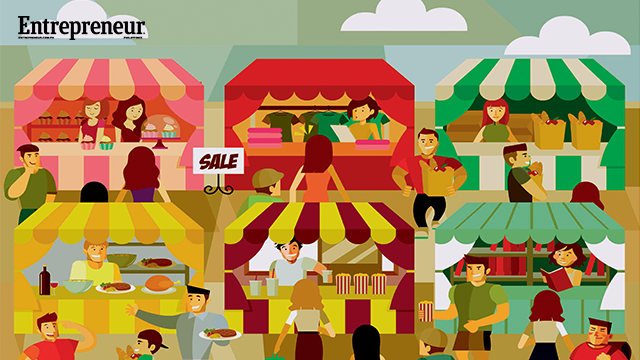 For startups, joining bazaars seems the perfect springboard into entrepreneurship. Veterans, meanwhile, return to break new ground—be it a new market segment or product category. With foot traffic assured, ’treps could showcase their products, test marketability, and earn a buck or two without spending too much on rental of space. Know that the bazaar can be a war zone. Given the number of concessionaires, your booth needs to stand out. Getting heard above your neighbor’s staccato come-ons is a challenge. And sometimes—if you’re lucky—a deluge of customers may wipe out your stock on your very first day. What do you do? Jan Michael Jose of Yabang Pinoy, organizer of the Global Pinoy Bazaar that has showcased Pinoy-made products since 2007, says that aside from consistent product quality, shoppers value uniqueness. “Shoppers go to bazaars for the novelty… They go to see products that are not available elsewhere,” adds Mark Tan, also of Yabang Pinoy. Ang observes that affordable personalized gift items not found in malls usually sell well at a bazaar. Run-of-the-mall just won’t cut it. Anafel Librojo and Rayneliza Lopez, owners of Seasonless Boutique, took the risk of selling hip men’s clothes when they joined the World Bazaar in 2013. Sourcing from Divisoria was out of the question; their items came from Bangkok, tagged at premium prices. “We wanted our customers to buy, not because we’re cheap, but because we sell quality items,” says Librojo. They almost ran out of merchandise on the third day of the 17-day bazaar. To replenish their items, they bought from suppliers who also imported from Bangkok or China. Flush with that success, they’ve opened a booth space in an area for small, independent brands at Robinsons Metro East in Pasig City. As early as September, they also start preparing for the upcoming World Bazaar. Pair a good product with a good location, add the right visuals, and start counting your money. Librojo and Lopez picked a booth near a restroom. To get the attention of customers who were on their way to the restroom, the two lit up their booth, and put spotlights on the mannequin. “Para kapag lumingon ang customers, makikita,” says Librojo. Customers came in droves. TV host Jhong Hilario, together with his family, were among those who got curious, checked out their clothes, and bought a lot. Hilario even made a return trip, and wore Seasonless Boutique clothes that entire week on the popular ABS-CBN noontime program Showtime. Vice Ganda, the show’s main host, also dropped by. At Global Pinoy Bazaar, around 200 exhibitors are organized based on product category: clothing, accessories, food and art. But for this year’s edition, the bazaar was divided into three parts, with the first two done from June 30 to July 3 and August 10 to 14. The last one will be held on December 7 to 11. Jose and Tan say it is more advantageous for exhibitors with similar products—and market—to occupy the same block. “There are customers na meron gustong puntahan lang. If makita ang shop na katabi, merong tendency to shop there, too,” says Tan. Ang, however, says, “There’s a 50 percent chance of loss if your booth is beside another with similar products. That’s competition.” Although World Bazaar has two sections—food and goods—it is unlikely that a customer will be able to visit all 200 booths. Thus, to level the playing field, exhibitors with similar products are scattered. “The thrill for customers is going around the venue the entire day and actually finding something na sobrang mura, sobrang sulit—the eureka moment. That’s the moment that you want to keep in every event. It’s like a huge scavenger hunt for the best deals,” says Ang. “Booths should not look cluttered or too crowded. The bazaar venue is a crowded place already. So [practice] minimalism when it comes to design works. There should be a sense of order,” advises Jose. Ang suggests displaying the products in such a way that the customers will “experience” them. “They should feel, ‘I got my money’s worth’,” he says. Seasonless Boutique makes sure that customers can browse unimpeded, taking in all the items at a mere glance. “Umiikot kasi ang tingin nila,” says Lopez. Overdressed or much-too-pretty booths are not advisable. “Customers tend to be intimidated when they see na masyadong maganda ang booth. Iniisip nila agad, mahal,” says Librojo. Well-designed collaterals, like posters and other marketing materials, help a lot in bringing in customers. They should be thematic to the product, adds Tan. While it is highly recommended that owners man their booths, well-trained staff is the next best thing. “Untrained staff can just… [be] guarding your merchandise, but not necessarily selling your products,” warns Mariella Veluz, owner of Sewn Sandals, a regular at Global Pinoy Bazaar. Citing Seasonless Boutique, Ang says customers appreciate and remember you more when they are made to feel like a VIP upon stepping into your booth. “No-no din na isnabin ang customer. Dapat pare-pareho ang treatment sa customers kahit naka-tsinelas lang sila,” says Librojo. Sometimes this adds to your social media buzz. “We’ve had customers taking photos of our giveaways rather than the clothes they bought. They really feel happy when they get something for free even if it’s just a small thing like a fan,” reveals Librojo. Lopez chimes in that they make sure that clients leave with a smile—whether the latter bought something or not. They also encourage customers to walk around the venue and compare items and prices. If they linger, they just might come back. This article originally appeared in the November 2014 issue of Entrepreneur Philippines magazine. Minor edits have been made by Entrepreneur.com.ph.